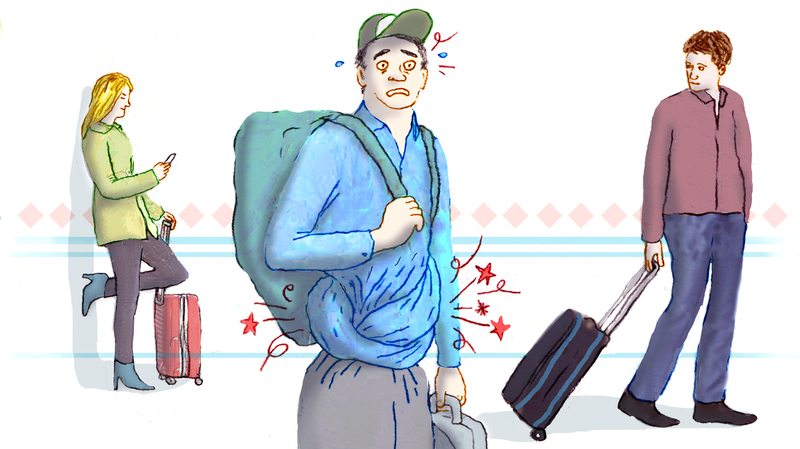 Can You Protect Your Tummy From Traveler's Diarrhea? : Goats and Soda There are about as many myths and misconceptions about traveler's diarrhea as there are names for it, such as Delhi belly and Montezuma's revenge. We're here to explain what actually will help. It goes by many names: Delhi belly. Montezuma's revenge. The Aztec two-step. But doctors use one not-so-glamorous term: traveler's diarrhea. If you're visiting a place this summer with less than ideal sewage disposal — maybe a resort in Mexico or a village in Rajasthan — chances are your GI tract will give you trouble at least once ... maybe twice ... maybe continuously. There are just about as many misconceptions and myths about traveler's diarrhea as there are names for it. So we're here to try to set the record straight — or at least discuss what's known and not known. We dove into the literature and talked to two pioneers in the field to figure out what causes Montezuma to take revenge, what precautions might work and what to do when your tummy starts to rumble. 1. I'm sick because the food has "different" bacteria in it that my GI tract isn't accustomed to. FALSE. Hop on a red-eye flight from New York to New Delhi, and in 24 hours you'll literally have "Delhi belly." About half the bacteria species in your gut will switch from those typically found in New Yorkers to those found in New Delhi residents, says Dr. Bradley Connor, who directs the New York Center for Travel And Tropical Medicine. "But that's not what makes you sick," Connor says. Those bacteria are the "good guys." They're the bacteria that help you digest food and tune your immune system. Problems arise when you accidentally pick up a "bad guy" — a pathogenic bacteria, Connor says. These bacteria would make you sick anywhere in the world, even here in the U.S. They're just more common in developing countries because they're found in raw sewage. A few years ago, researchers in Finland analyzed stool samples from 96 travelers who had returned home from developing countries with GI problems. The team could identify the likely culprit(s) in three-quarters of the samples. The vast majority were some form of diarrhea-causing E. coli. Some strains produce a molecule that literally tells your GI tract to leak water and chloride (hello, watery diarrhea). Others punch holes in your gut. Viruses and parasites can also cause traveler's diarrhea, but they're much rarer, says Dr. David Shlim, president of the International Society of Travel Medicine and director of Jackson Hole Travel & Tropical Medicine. "Importantly, giardia, amoebas and other parasites don't typically show up in the first month of travel," he says. 2. If I keep eating the local cuisine for a month or so, I'll build up immunity to the bacteria. FALSE. Shlim has spent 30 years studying travelers' illnesses in Nepal. He found that long-term trekkers and expats will eventually build up immunity to diarrhea-causing bacteria. But it takes years, not weeks or months. "Over a five-year period, your chances of coming down with diarrhea continue to drop," he says. "And you get less severe cases. But nothing changes much for one to two years." So why don't the locals get sick? They did — when they were kids. Young children in developing countries are frequently exposed to diarrhea-causing E. coli and thus build up immunity to these strains during the first few years of life. These types of E. coli are much rarer in the U.S., so kids here never become immune to them. 3. Washing my hands will keep me from getting sick. FALSE. Sure, a quick wash with antibacterial soap will knock out bad E. coli. But that's unlikely to cut your risk of getting sick, Shlim says. "You can never really be against hand-washing," he says. "But the fact is that it usually takes a high quantity of bacteria, sometimes in the millions, to overcome your stomach acid. So just the random bacteria you get on your hands, I think, is unlikely to make you sick." 3. If I avoid certain types of foods, I won't get sick. MAYBE. The major source of traveler's diarrhea is contaminated food and water at restaurants, Shlim says. Avoiding the bad water is easy — just buy bottled water, boil it or treat it yourself. But the food part is trickier. Many travelers swear by the old saying "boil it, cook it, peel it or forget it." But scientific studies don't really back it up. One meta-analysis of seven studies didn't find a connection between getting bacterial diarrhea and eating raw vegetables or unpeeled fruits. But it did find a link between illness and foods that sat around at room temperature for a while. For example, if a kitchen worker accidentally contaminates a lasagna or quiche — and the dish then stays warm for a while at a buffet — it can make you sick, even though it's been thoroughly cooked. The problem is usually poor hygiene in restaurants' kitchens, Shlim says. "There may be a toilet in the kitchen and no place to wash hands. Or raw meat is chopped up on the same surface as fresh vegetables and fruit," he says. But there is one strategy that seems to work, Shlim and Connor say: high temperature. "So the food is too hot for you to initially bite into right when it comes to your plate," Shlim says. "That makes safe foods." In the end, he says, getting sick often boils down to bad luck. You picked the wrong restaurant or even just took a bite of the wrong piece of fish. 5. If I get sick, I should take an antibiotic. MAYBE. Ten years ago, standard advice from travel clinics was clear-cut: Take a pack of Cipro on your trip and pop a pill at the first rumbles in your belly. Back in 2006, I was given that exact advice from a clinic in Berkeley. Now the advice is a bit more nuanced. Travel doctors don't recommend taking antibiotics for mild or moderate cases of diarrhea — and definitely not as a preventive measure. "Your body will naturally fight off bacterial diarrhea in three to seven days," Shlim says. But if you're running to the bathroom several times a day — or have bloody stools — then Shlim recommends a quick dose of antibiotics. "You'll feel much better in six to 24 hours." And you don't need to take a full five-day regime, Shlim says. "Most people will be cured with one day's treatment, either two doses of ciprofloxacin or a single dose of azithromycin. The message is you can stop [taking the drug] when it is clear that you are starting to recover." One concern with travelers using antibiotics is the rise of drug-resistant bacteria around the world. Some studies have suggested that travelers may exacerbate the problem. But, Shlim says, compared to the widespread misuse of antibiotics in many developing countries, tourists' use of the drugs is a tiny drop in a vast ocean. "I don't think a traveler can go to India with more than a billion people in it, take an antibiotic and change the resistance pattern of the subcontinent," Shlim says. "It's the pharmacy on every corner that gives out antibiotics for every illness that causes resistance, not tourists" — not to mention the wide use of antibiotics in agriculture around the world. Another concern about using antibiotics on vacation is that the drugs disrupt a healthy microbiome. More research is needed to figure out if and how a brief dose of antibiotics alters the microbiome in the long run, Connor says.